Exceptional ‘End of the world’ films are a rare breed now-a-days; but is that mainly due to how great Independence Day was, and very much still is? This film is about a colony of aliens that visit earth, blow up world landmarks and have the sole purpose to kill everyone on the planet with no mercy. Steve Hiller and David Levison (Will Smith and Jeff Goldblum) both have completely separate story lines until the “final mission”. Both stories are well written building two characters that complement each other well for the climax of the film. The first story line is introduced when David Levison picks up a transmission from the alien mother ship and must get this essential information to the president. The second is less predictable: Steve Hiller crashes his one-man fighter plane alongside an alien, presenting the opportunity to get an alien corpse to Area 51 for examination. Whenever Will Smith gets a chance to hit an alien, you better be prepared for the worst. The air battles in Independence Day are sublimely executed having a strong high-paced impact with the ‘goodies’ and ‘baddies’ easily identifiable, leaving the viewer to cheer on Team Human. The action and combat scenes are instrumental to this disaster film, which add to the film’s overall appeal taking one foot into the realm of a ‘manly’ film. 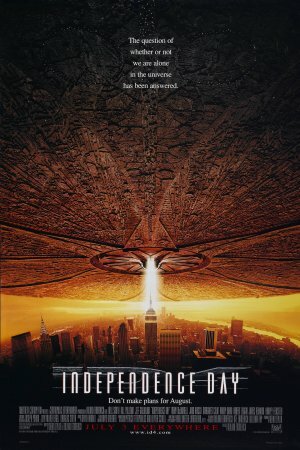 Any flaws that subsequent ‘End of the World’ films, like ‘The Day After Tomorrow’ or ’2012,’ might have is predominantly down to the fact that they are not ‘Independence Day’. It’s well written, well directed and very well cast, creating a film that seems timeless and long may it continue. If you enjoyed this then you’d enjoy Deep Impact and Armageddon.